This software is not currently maintained. This computer program attempts to convert book chapters downloaded from Oxford Scholarship Online to PDF. The PDFs are better than those the OSO website can generate: the pages of the PDF correspond to the pages of the original book, and the typography is nicer. The hard work is done by Pandoc and LaTeX. 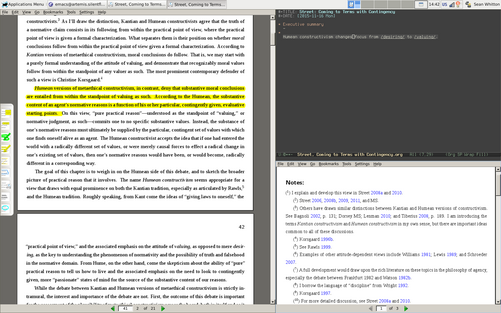 Annotating an oso2pdf PDF with okular and making a few notes in Emacs. N.B. This software is of use only to someone who has legitimate access to Oxford Scholarship Online and has already downloaded a book chapter to their own computer. It does not make any network connections to Oxford Scholarship Online and it cannot assist in breaking the license terms Oxford Scholarship Online users are bound by. oso2pdf is available from Hackage, so if you have a working Haskell installation on your machine you should just be able to run cabal install oso2pdf. In this example Pandoc is instructed to make use of the files ~/.pandoc/templates/pessay.latex and ~/texmf/tex/latex/pessay/pessay.cls (see my dotfiles repository; the file pessay.cls is released under the GNU AGPL 3). Indeed, any arguments passed after -- will be ignored by oso2pdf and handed on to invocations of Pandoc. oso2pdf is written in Haskell. Please report bugs and submit patches/pull requests by e-mail. I’d also appreciate hearing from you if this program has been useful to you. oso2pdf is free software: you can redistribute it and/or modify it under the terms of the GNU General Public License as published by the Free Software Foundation, either version 3 of the License, or (at your option) any later version. oso2pdf is distributed in the hope that it will be useful, but WITHOUT ANY WARRANTY; without even the implied warranty of MERCHANTABILITY or FITNESS FOR A PARTICULAR PURPOSE. See the GNU General Public License for more details. You should have received a copy of the GNU General Public License along with oso2pdf. If not, see <http://www.gnu.org/licenses/>.